Bad weather kept Evelina and her servants indoors. As Old Oliver recorded, “the ground froze some last night and it is verry cold to day for the season wind high from north west and some cloudy.” It was a good day for making barberry sauce, especially with three young women to help. The shelves in Evelina’s pantry – or buttery – and cellar must have been nearly full of jars of preserved fruit. There would be plenty to go around come winter. And winter was coming. It was a good day, too, to catch up on mending. At least some of the mending consisted of darning the holes in the socks – or hose – worn by everyone in the family. 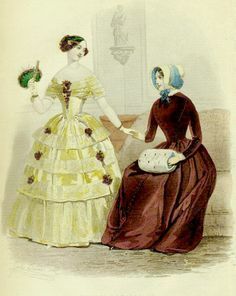 Darning eggs, such as the ones in the illustration from Godey’s, were found in most homemakers’ sewing kits or work baskets. They were held on the inside of a sock to keep it firm while the stitching was done on the outside. Some intricate darning eggs also held needles, thimbles, and other tiny sewing utensils on the inside. The prosaic simplicity of the day’s chores would not have raised any suspicion on Evelina’s part that seven years from this day, John Brown and a band of cohorts would lead a raid at Harper’s Ferry, Virginia. The incident would shock and alarm the nation as it realized that even in the civilized “Old Dominion” – as opposed to places on the wild frontier, like Kansas or Missouri – arms would be raised to eradicate slavery. None of the Ameses knew, of course – no one could – but a civil war between the states of the North and South was drawing near. There were fresh peas at the Ames dinner table today. We readers might not have enjoyed them, however, as the recipes of the time called for cooking peas – and other vegetables – much longer than our modern preferences allow. 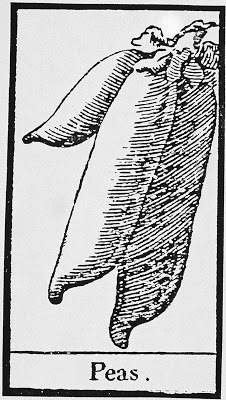 Domestic doyenne and editor of Godey’s Lady’s Book, Sarah Josepha Hale, declared that peas are “a most delicious vegetable,” but cautioned that “[i]t takes from half an hour to an hour to boil them.”* That seems overcooked to us, but, nevertheless, the Ames’s peas were fresh, untarnished by pesticides, and indisputably local. With her niece Lavinia Gilmore, Evelina went to visit her nephew (and Lavinia’s half-brother) Alson Augustus Gilmore, who had lately been ill. He was now well, but his one-year old son, Willie, had become “quite sick” with dysentery. Had the child caught something from his father? Or was he suffering a condition not uncommon in children in the heat of the summer? His bright red face suggests fever and dehydration. Augustus and his wife, Hannah, would have been worried about the little boy. satisfied with my days work Very cold. Susan Ames probably would appreciate the muff that her mother was making for her to keep her hands warm. She already had one for “best” to wear to church, but this one would be for everyday. 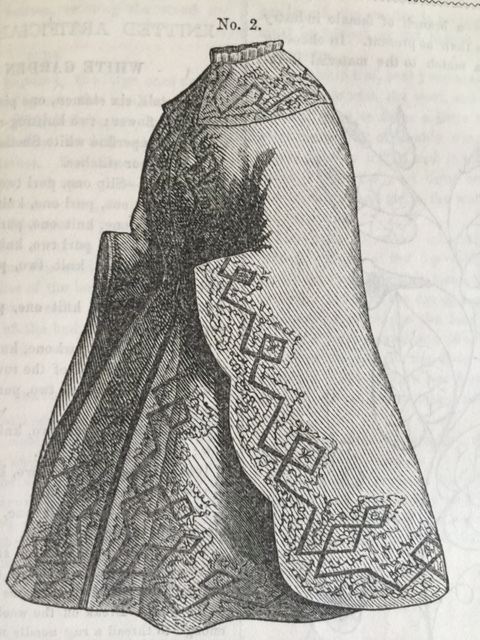 Made from recycled pieces of fur off her mother’s cloak, Susie would be making quite a fashion statement for a nine-year-old school child, most of whose classmates would likely have worn mittens. Even Meg and Jo March had to walk to their jobs without muffs, holding instead warm popovers fresh from the oven to keep their fingers from numbing up. At day’s end, Evelina was “very well satisfied” with the muffs she had reworked. The household today appears to have been running well which would have amplified Evelina’s happy mood. Jane McHanna must have worked some magic to get the laundry done despite the snow storm. Emily Witherell delivered a Christmas gift from her mother, Sarah Witherell, to her Aunt Evelina, a gesture that may have caught Evelina off guard. In practice, the Ameses had not been in the habit of observing Christmas, finding this religious celebration too festive for their Puritan-derived tastes. Yet times were changing and, in future years, Evelina would become both a recipient and giver of Christmas presents. 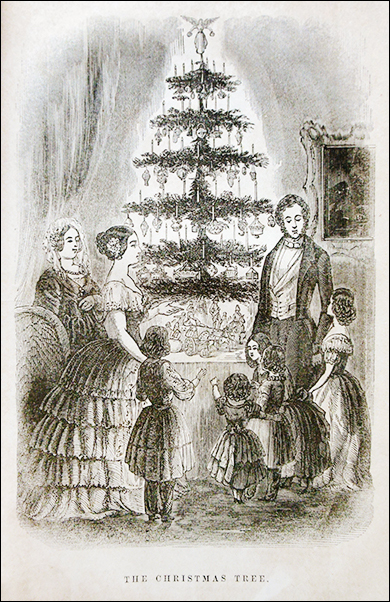 Evelina’s transition from being suspicious of Christmas to celebrating it was stimulated by various factors, not the least of which was its promotion in her favorite magazine, Godey’s Lady’s Book, the same magazine whose subscription Evelina renewed today. 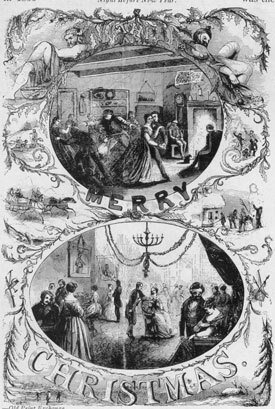 The periodical recognized and encouraged the holiday’s appeal to its well-heeled readers, many of whom would have read Charles Dickens’ A Christmas Carol, published less than a decade earlier. Unlike Unitarian (and one-time Congregationalist) Evelina, a growing number of Godey’s readers were less hide-bound to a doctrine devoid of celebration. The influx of Irish Catholics, who did honor the holiday, influenced some of this change, too.